GPS units are great for mountain biking, filling the role of both cycling computer and trail map in one simple package. Back in 2006 we wrote about using your GPS for trail navigation and clearly a lot has changed since then. This article is an update to the 2006 article; look for another post on using a GPS for cycling training in the future. Ok, so how is a GPS comparable to a printed trail map? It all starts with the basemap. Imagine a printed, paper map showing labeled roads, topo lines, and trails laid out underneath your GPS unit. The GPS is your window into that map and you can use the GPS controls to scroll around, sorta like moving the window while the paper map stays in place. If you've used Google Maps or MapQuest, it's the same idea. Some GPS units and smartphone applications even allow you to use your fingers to move the map around. Now, here's where the GPS technology comes in. With a paper map, you're constantly having to orient yourself to the map - determining where you are on the map and the direction you're heading. With a GPS on the trail, that's automatic - you can set the map to pan and orient itself based on your location and heading so whenever you look at it, the map shows what lies ahead. 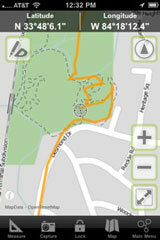 Most GPS units will also trace a line on the map showing where you've been. 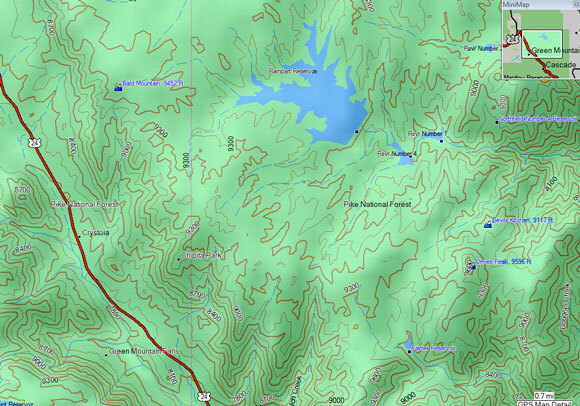 Garmin topographic basemap (desktop view). 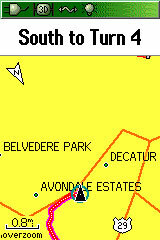 Not all GPS units include basemaps and the level of detail can vary widely between models. Some models, like smaller, wrist-mounted GPS units, don't include basemaps at all which makes them less useful for navigation (like having a window but no map underneath it - but keep reading). If you're planning on using a GPS for navigation, look for a unit with a large, color screen, and find out which (if any) basemaps are included. For mountain biking you'll want topographic basemaps - street maps (similar to the ones used in vehicle nagivation systems) are mostly useful for road cyclists. Basemaps, particularly detailed ones, can be memory-intensive so make sure your GPS has plenty of built-in storage capacity or expandable storage. Try to find a unit with enough built-in memory to store the entire basemap; otherwise you'll need to load individual map sections every time you head out to explore a new area. Higher-end GPS units with detailed basemaps may be able to route you from point A to point B (like Google Maps) but as far as we know, this only works with roads. If you're trying to get from the trailhead to the overlook on a trail, you need to make use of a track log. Beyond the paper map metaphor, there's another way you can navigate trails using your GPS: the track log. Each time you use your GPS you're creating a track log - basically a series of connected dots that show where you've been. The simplest use-case is backtracking: using your track log to help you find your way back to where you started. When following a track log, different GPS units offer different degrees of hand-holding. Most will tell you how far you have to go on the track (actual distance, not straight line) while others will even direct you when you're approaching a turn. Left: GPSTuner smarphone application. Right: Navigating a track log on a Garmin GPSMap 60. Beyond backtracking, it's often helpful to follow others' track logs when riding an unfamiliar trail system or to navigate a recommended route. You can download GPS track logs online from sites like singletracks or get them from friends who rode the route previously. Most track logs can be found in GPX format which may need to be converted before loading onto your GPS. To load onto your GPS you'll need to connect the unit to your computer using a USB cable (though smartphones and newer units may be able to do this wirelessly). Many GPS units that aren't sophisticated enough to utilize basemaps may be able to load and navigate track logs. Even a simple wrist-mounted GPS like the Garmin Forerunner 205 has "Back to Start" and "Route Navigation" functions. For many riders, knowing they're on the right track during the ride is just the information they need. Most GPS units and software employ different methods of loading and using basemaps and track logs so it's important to consult the documentation that came with your GPS to use these features. Knowing the difference between a basemap and a track log will have you well on your way to using your GPS for mountain bike trail navigation! 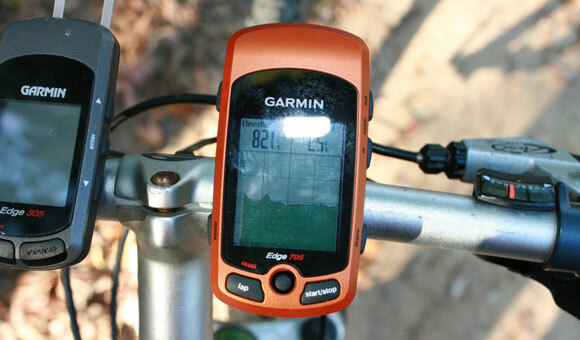 Looking for more info about mountain biking with a GPS? Check out the new and improvedGPS channel on singletracks.